Catch the first set of interviews from the junket here - for everything else from the press conference check out our wrap. The Hot Hits - view on their site or below. 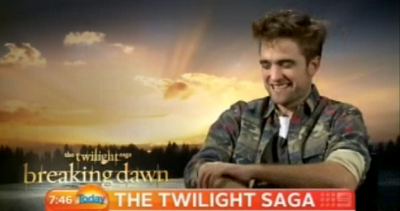 Rob: I'm sure some people will say 'they changed the story!' but I hope they'll still like it. Rob: I'm filming a lot of movies next year. For starters, 'The Rover' is some sort of futuristic western that means a lot to me. And I might film in Iraq but I'm not sure when. And finally I'm gonna shoot with Cronenberg again, it's incredible. More from E! (new stuff starts at about 1:50). Watch on YouTube or below.